A firm favourite of the late great John Peel and championed by 6 Music, Davey Woodward has been a prolific songwriter for decades with bands like The Brilliant Corners, The Experimental Pop Band and Karen. Most recently he decided he wanted to swerve away from his indie comfort zone and record an album of songs quickly with people he had never worked with before, intending, he asserts, to have the songs sound effortless and hark back to a time when artists like Bowie or Dylan would go into the studio without finished songs, working the song out while the tape was rolling. 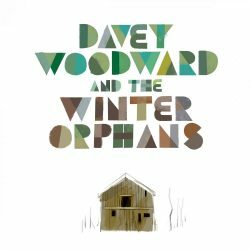 Thus The Winter Orphans were born and the story goes that guitarist Julian Hunt had not been in a studio for over a decade, while drummer Steve Dew knew a guitarist Mark Van Vasey, who was pressed into playing bass and piano instead. Woodward played them his songs with the lyrics unfinished and the chords changed many times over the five rehearsals they had prior to the recording, which took place over a long weekend in July 2017. So far, so would-be Basement Tapes and the spirit of Dylan is invoked throughout this stripped-back album with Woodward evidently trying to sound just like the great man and even a closing track called “Dylan’s Poster” in case you’ve hitherto missed the point. An interesting curveball to throw Woodward’s camp-followers, it’s an eminently listenable if not necessarily riveting affair with Woodward’s song-craft shining through the engagingly ramshackle setting. Opening track Caroline is very Go-Betweens-esque and from then onwards it’s all a bit too ‘spot the influence’ to elevate the whole package above the merely diverting.